Heritage Plaza, part of the 112-acre Heritage Park owned by the City of Forth Worth, was designed by internationally-renowned landscape architect Lawrence Halprin (1916-2009), who was known for his work with urban spaces. Heritage Plaza was built to commemorate Fort Worth’s rich history as a part of the nation’s bicentennial celebration. The plaza, situated on a bluff that provides sweeping views of the Trinity River, is a meditative space that focuses on the site’s natural and scenic wonders. 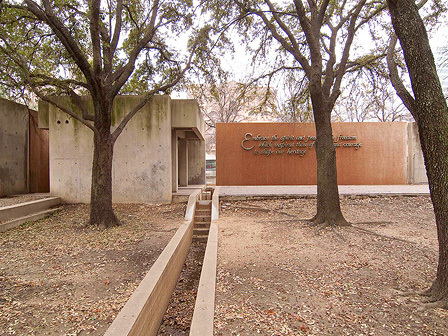 Lawrence Halprin designed Heritage Plaza at the Request of Streams and Valleys, a local non-profit organization, and Ruth Carter Stevenson. Halprin also designed the Franklin Delano Roosevelt Memorial in Washington, D.C. and the Ghiradelli Square in San Francisco. Heritage Plaza was designated a 2008 Landslide list “Endangered Marvel of Modernism” by the Cultural Landscape Foundation and was determined eligible for the National Register of Historic Places. The City of Fort Worth Parks and Community Services Department closed Heritage Plaza in summer 2007. Its fountains are dry, and its walls and walkways are not being maintained. The trees and plantings within plaza reveal years of neglect, adding to the perception that the park is an unsafe place. The city has not provided any updates on its plans for the park, and it will remain closed until future actions are determined. Rather than being cherished a community asset, Heritage Plaza has literally been kept in the dark, as have the citizens of Fort Worth. Nominator: Historic Fort Worth, Inc.